The bqJUNIOR? series BQ27010 are highly accurate stand-alone single-cell Li-Ion and Li-Pol battery capacity monitoring and reporting devices targeted at space-limited, portable applications. The IC monitors a voltage drop across a small Current Sense resistor connected in series with the battery to determine charge and discharge activity of the battery. Compensations for battery age, temperature, self-discharge, and discharge rate are applied to the capacity measurments to provide available time-to-empty information across a wide range of operating conditions. Battery capacity is automatically recalibrated, or learned, in the course of a discharge cycle from full to empty. Internal Registers include current, capacity, time-to-empty, state-of-charge, cell temperature and voltage, status, and more. 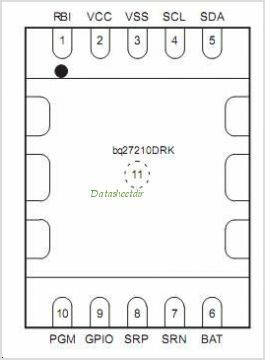 This is one package pinout of BQ27010,If you need more pinouts please download BQ27010's pdf datasheet. 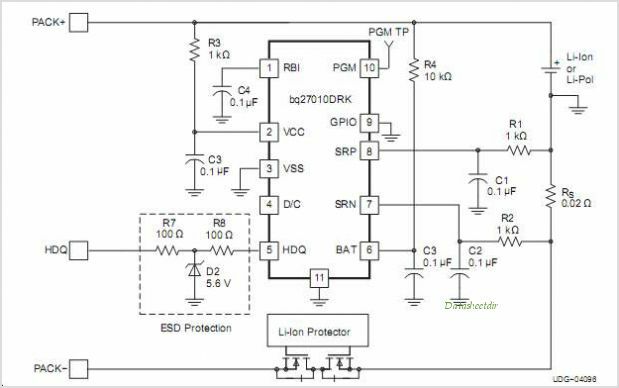 This is one application circuit of BQ27010,If you need more circuits,please download BQ27010's pdf datasheet.